Does the box below look at all familiar to you? For those new to the field, this appliance may be a bit of an enigma. But veterans of the industry will no doubt recognize it. 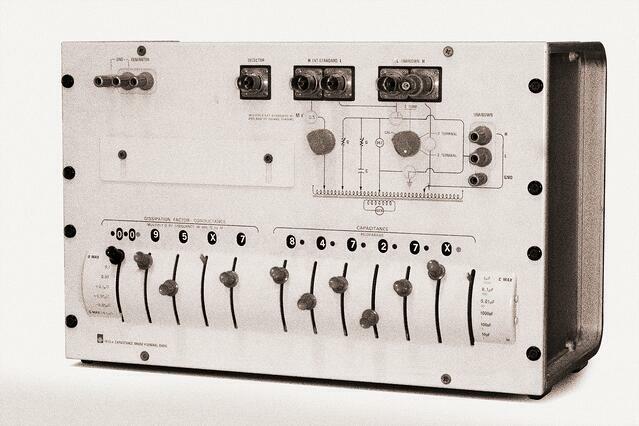 Back in the day—in the 1970s, to be more exact—the General Radio Type 1615-A capacitance bridge served an important role for a certain type of cryogenic measurement. Specifically, when used in conjunction with strontium titanate glass capacitor sensors, it enabled one to measure temperature in the presence of magnetic field. It did the job until more specialized instruments came along. The bridge shown above is from the Lake Shore Museum. We’ve hung onto it, and instruments like it, for the benefit of our in-house industry history buffs, both young and old. If, like them, this sort of history interests you, be sure to read this article published in the most recent issue of Cold Facts. Written by Lake Shore’s Ryan Oliver, the article explores the evolution of the instrumentation and techniques commonly used to measure and control temperature since the 1940s. So give it a read to see if any of the instrumentation mentioned, including those from our own product portfolio, ring a bell for you. In "cryogenic process control, probe stations"